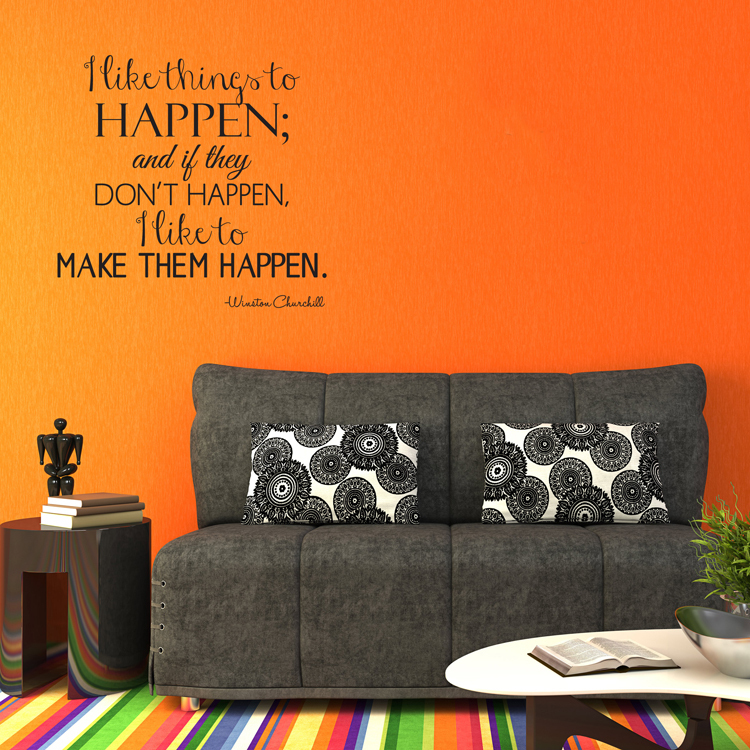 "I like things to happen, and if they don't happen, I like to make them happen." We love this quote by Winston Churchill! Make it happen, people. Get up, get going, get moving, and get stuff done! Our wall decals are ideal for bedrooms, offices, living rooms, entryways, classrooms, even your car, bathtub or glass shower doors! 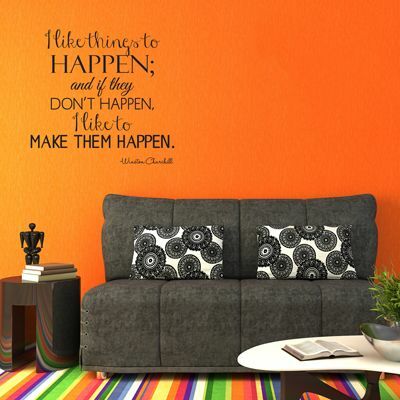 This Make it Happen decal measures 26.5 inches wide by 25 inches high. This decal comes in mostly one piece, ready to apply! The Winston Churchill part needs to be cut apart and placed underneath during application. Easy peasy! I so rarely write anything like this that it takes something EXCEPTIONALLY good to overcome my inherent laziness! With that said, first of all! I ordered a small $10 decal to see if Dali Decals was as good as they seemed or if it was just hype. Well, that worked out well and they have a super awesome shipping box (wait til you see it) so I decided to do a custom order. I had a couple issues with the Illustrator file and Alicia from support gave me *BY FAR* the best support I've had from any company in any industry for at least the past 3 years. It is *SOOOO RARE* these days to find a company that has a quality product with a quality website and quality ordering and quality support. I recommend Dali Decals to anyone who will listen. They are like the Apple of interior decoration. Just recieved our decals and they look great on the wall! Love the dandylion blowing in the wind on my grey blue walls in my bedroom. Thank you! Hi -- I just wanted to send a quick thanks to Robert Chadwick. I've ordered your decals for my home and love them. When the opportunity came up to redesign a wall in our nonprofit counseling/wellness center, I suggested a custom decal from you. I'm not a designer so my file wasn't quite right, but Robert was so patient and helpful and was able to get my files into shape. Thanks for such great service! We'll be sure to send a picture along once our decal is up! This is the 2nd decal I've purchased from Dali Decals! Love love love my latest decal. This one was a three panel decal and it went on perfectly. The key was using a level to make sure it was straight, but after that - a piece of cake! Love the results-- its such a great addition to our new home! Thanks so much!